Enjoy the best golf course in Cambodia during your journey in Siem Reap. Book your round now to tee off from 11th century and finish your round in the 21st century. For those who are seeking a few rounds of golf in Siem Reap, on top of the availability of plentiful activities in Siem Reap, Sofitel Angkor Phokeethra Golf & Spa Resort manages the top country club Cambodia is home to. The Phokeethra Country Club has been an established name for years for both professionals of the sport and guests who wish to enjoy golf in Cambodia on top of other exciting activities in Siem Reap. The world-class facility has been host to a number of international tournaments, including the Johnnie Walker Classic in 2009 and the Cambodian Open in 2010. Now, with a recent remodel courtesy of renowned course architect Major General Weerayudth Phetbuasak, the golf course Siem Reap locals are so proud of, is set to become more famous than ever before. It is truly the perfect venue for all enthusiasts of the sport looking to play an unforgettable round of golf in Cambodia. The onsite restaurant serves an array of delicious continental, Khmer and Asian cuisine to please your palates after a long morning of playing golf in Cambodia. The friendly and attentive staff are also more than happy to offer recommendations, to ensure that all visitors are met with a five-star experience. 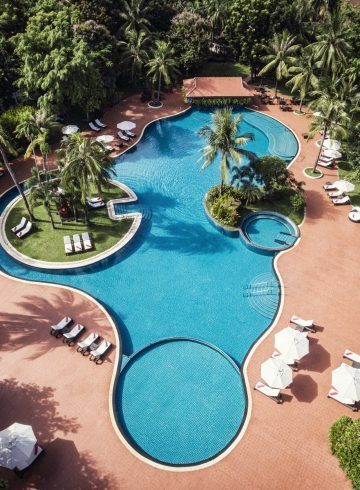 This attention to detail and personalisation of our services is one of the reasons Phokeethra Country Club is the top country club Cambodia has to offer. In addition to the finest country club Cambodia based, there are many reasons the course is perfect for those looking to enjoy golf in Sieam Reap. One is its unrivalled location, with rolling fairways and water features nestled within the natural landscapes of Siem Reap’s sprawling countryside. Now, the addition of new cart paths to take you through the winding greens have made playing golf in Cambodia easier than ever before. The course is also only a short distance from Sofitel’s picturesque grounds, making it efficient for anyone who wishes to indulge in a few rounds of golf in Siem Reap during their stay in paradise. Moreover, as Phokeethra Country Club is regarded as the best country club Cambodia is home to, its luxury facilities ensure the style, comfort, and top quality service associated with all Sofitel affiliated establishments. The clubhouse is intricate in its design, offering five-star amenities that extend to its dining and drinking venues, locker room and relaxation facilities. Fans of the sport who are looking to indulge in rounds of golf in Cambodia, among other activities in Siem Reap, can also look forward to the fitness and wellness facilities available at the clubhouse, including locker rooms and showers that exude comfort. In keeping with being best country club Cambodia is home to, the clubhouse also offers a professional golf store onsite, which is stocked with the latest branded gear and souvenirs visitors can purchase to remember their experience playing golf in Siem Reap. Our friendly staff can also give advice and offer information about gameplay and activities in Siem Reap. Phokeethra Country Club also has practice facilities comprised of separate pitching and putting greens, giving all golfers the chance to hone their skills before a formal game of golf in Cambodia. In addition to world-class facilities, the course is the beacon that draws in anyone hoping to play golf in Cambodia. A combination of Barbados grass varieties are used to form the fairways, giving the 7,145 yard, 18-hole course its notable emerald colour, while also guaranteeing a high standard for course conditions in all types of weather. This is our way of promising all of our valued clients that they will be able to golf in Cambodia at any time of the year. As a championship calibre golf course Siem Reap is home to, the layout also features an array of natural lagoons and sand traps to challenge golfers of all abilities choosing to parktake in golf in Siem Reap. The course is a mix of tricky par 3s and individual par 4s and 5s, which require both long drives and solid direction. As a challenging golf course Siem Reap located, there are also water bodies on all but one hole, and the 18th hole features a signature double water carry— a daunting final shot onto an island green. The course’s difficulty is a testament to how Phokeethra Country Club promises a golf in Cambodia experience like no other activities in Siem Reap.